Charlie Young is an avid performer of solo and chamber works on five instruments (saxophone, bassoon, clarinet, flute, and oboe), an emerging composer, and an active arranger. He serves as Assistant Professor of Woodwinds and Director of Jazz Studies at Minot State University, where he teaches applied saxophone, clarinet, and bassoon, music theory, and directs the jazz program. He also holds the principal clarinet chair of the Minot Symphony Orchestra and the Western Plains Opera Company. Charlie’s background in woodwind playing and comfort across genres has granted him appearances with the world-renowned Four Tops and with two seasons of the national touring company of the Broadway hit, Chicago. 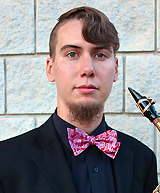 This spring he and clarinetist Pedro Alliprandini appeared as guest artists at Florida State University, Georgia State University, Columbus State University, and the University of Montevallo presenting master classes and a duo recital program of 21st century music for saxophone and clarinet. Just prior to this, in January he shared the stage with the University of Georgia Symphony Orchestra performing Frank Martin’s Ballade as a winner of UGA’s Concerto Competition. As baritone chair of the Nach Saxophone Quartet, Charlie has advanced to the national finals of both the MTNA Chamber Competition and the North American Saxophone Alliance (NASA) Biennial Quartet Competition. Charlie has completed coursework for his Doctor of Musical Arts degree in saxophone performance with a minor concentration in music theory at the University of Georgia. He also holds an MM in woodwinds from the University of Southern Mississippi and a BM in education from the University of Mississippi. His primary teachers include Connie Frigo, Lawrence Gwozdz, Kimberly Woolly, and Wade Irvin.